An Israeli company has claimed that they will have a universal cure for cancer within a year. This seems highly unlikely. An Israeli biotech company has claimed that it will have the cure for cancer within a year, bringing with it a flurry of viral news articles that seem to have accepted these claims at face-value. The New York Post and The Jerusalem Post both recently featured articles about Accelerated Evolution Biotechnologies Ltd (AEBi), a company founded in 2000 from the ITEK Weizmann technology incubator. There are a number of very bold claims in both articles, many which are unsubstantiated with no evidence provided by the company. People can largely say whatever they like, after all, but it is just unusual for biotech/pharma companies to do so without significant evidence to back up their claims. “Instead of attacking receptors one at a time, we attack receptors three at a time – not even cancer can mutate three receptors at the same time,” said Morad. This is categorically untrue. Cancers can have anywhere from one to tens of thousands of DNA mutations in their genomes, many of these being the “receptors” Morad vaguely refers to. A key principle of using multiple chemotherapy agents at once is to go after cancer cells by several different routes to reduce the chance that they will become resistant. Still, many cancers do become resistant to these treatment protocols, so Morad’s logic here is extremely shaky. Hearing about new “cancer cures,” with little-to-no evidence backing this up is not a new scenario for the hundreds of thousands of healthcare professionals and researchers all working towards the goal of better treatments for cancer. We are used to fielding questions about everything from baking soda to lemons curing cancer, often from desperate cancer patients or their families. It is frankly, heartbreaking, with cancer patients increasingly turning to crowdfunding to raise money for these unproven cancer cures. Delving into what the company does supply, there are two graphs and some pictures taken down a microscope, much less than I provided from a 6-week undergraduate research project a decade ago. But is there any way the treatment could possibly be proven in a year, even if their approach does work? “I doubt it, based on what they disclosed to the public. Apparently, the work has only been done in mice. Anything tested in mice has to undergo testing in other animal species, be formulated, and then approved to administration in Phase I clinical trials in humans,” said Dr Benjamin G. Neel, M.D., Ph.D. Professor of Medicine at NYU School of Medicine and Director of the Laura and Isaac Perlmutter Cancer Center. The Israeli company also claims that their therapy will work for all types of cancer. To those involved in cancer research, this is a huge red flag. There are broadly over 200 different types of cancer and within those, multiple other subtypes. For there to be one, universal “cancer cure,” that overcomes all of these differences is highly unlikely. If it ever comes to fruition, it is unlikely to come from a company whose website offers merely two crudely made graphs to prove this and whose chief scientist appears to have largely published in the botanical sciences, the last paper being 17 years ago. A search of the chief scientist on PubMed, which indexes all papers involving medical research returns no results. “One should never say never in science, but I think it is quite unlikely that we will see a single magic bullet for cancer. We don’t have single magic bullets for infectious disease–different infections require different antibiotics, and even then, antibiotic resistance develops. Cancer is not a single disease–its multiple diseases, each caused by different combinations of genetic changes within different types of target cells. We already know how to cure many forms of cancer, and notably, all of these cures are different,” said Neel. If such a “magic bullet” treatment is ever made, it will surely be considered one of the greatest achievements of humanity to date. It is likely to involve thousands of scientists from all over the world, combining their expertise, experience and funding, but it is not going to be done within a year. Clinical trials for new cancer drugs, from the first time they are tested in patients to when they are approved by regulatory bodies, often take anywhere between 10-15 years, with only a few exceptions. So, are the claims from AEBi that they will have a cure for cancer within a year reasonable? “Based on what they released to the media, absolutely not. They haven’t provided any details about the approach. They haven’t published the data. And yet they make the extraordinary, and in my option, highly irresponsible and even cruel (to cancer patients) that they will cure cancer in a year,” said Neel. The company and some of the coverage has drawn international condemnation from some of the world’s largest cancer organizations. “Unsubstantiated claims that there will be a cure for all cancers in a year are irresponsible and can be misleading for patients. This oversimplifies the fact that cancer is more than 200 different diseases, which behave differently and pose different treatment challenges. This is why finding a single cure for all cancers is unlikely,” said Julia Frater, Cancer Research UK’s senior cancer information nurse. The American Cancer Society yesterday published a blog article from their deputy chief medical officer explaining why the claims are unlikely to be true. Among other valid points, it suggests that the approach by this company isn’t that unique and that other similar approaches have failed. Part of the statement from the American Cancer Society about the claims from the Israeli biotech company that they will have the cure for cancer within a year. Republished with permission of the American Cancer Society. 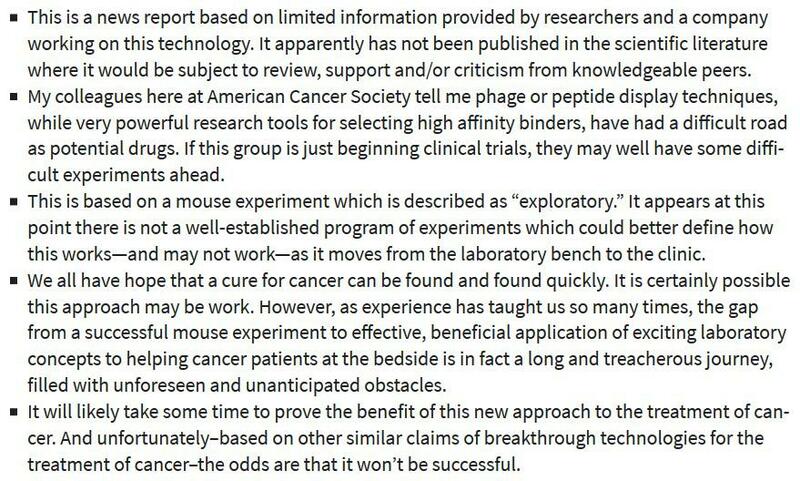 “It will likely take some time to prove the benefit of this new approach to the treatment of cancer. And unfortunately–based on other similar claims of breakthrough technologies for the treatment of cancer–the odds are that it won’t be successful,” said J. Leonard Lichtenfeld, M.D., deputy chief medical officer for the national office of the American Cancer Society. Cancer patients and those who care for them cannot be blamed for wanting to believe sensationalist stories like this one. The condemnation in this instance should go to both the company for making such bombastic claims about their product with essentially no evidence and also those journalists who have chosen to uncritically report on these unsubstantiated claims. After considerable pressure, The New York Post published a more balanced piece featuring the views of several experts urging caution about the news. However, the damage has already largely been done. Such awful, unbalanced coverage of cancer research erodes trust in not only health journalists but also everybody genuinely working towards better treatments for people with cancer. Cancer patients and their families deserve far better. This article was written by Victoria Forster from Forbes and was legally licensed through the NewsCred publisher network. Please direct all licensing questions to [email protected].